We work with a lot of women who are in perimenopause, and one of the most common complaints we hear over and over is weight gain, particularly belly fat around the middle. Many women are fine in their 20’s and even their 30’s. Once they move into their 40’s, their bodies no longer cooperate, and now they have a muffin top or a spare tire around the middle. Diet and lifestyle have not changed much, but all of a sudden, the weight keeps going up. To make it even more frustrating, what used to work to get rid of the weight no longer works. Going on a “diet” and exercising a bunch used to work when you were 25, but once you hit your 40’s, that approach no longer works. No matter how much you exercise, you can’t get the weight to budge. In fact, you have noticed that you have gained even more weight despite exercising 4 to 5 times per week. We understand how important it is for you to lose the weight and only want to have success in your weight loss efforts. Unfortunately, some of the standard advice you have heard on how to lose belly fat might be making your situation worse. We have put together a list of some helpful tips that might seem contrary to the archaic dogma that we have been “fed” for the last 60 years. In fact, these tips are part of the newest research and will get you headed in the right direction, so you finally start losing the weight you want. When women are in their 20’s and 30’s and hormones are balanced, they continue to cycle every month with no issues. As they progress into their 40’s, the inevitable decline of female hormones typically begins, and symptoms start to show up. Changes to the cycle, mood issues, insomnia, and weight gain, are the some of the most common complaints we see in perimenopause. These symptoms are typically related to lower progesterone levels. We know this because if a woman is still menstruating regularly, that means her estrogen levels are still reasonably sufficient. Weight gain of any kind, but particularly belly fat is an insulin/cortisol problem. Insulin is the only “fat storing” hormone in the body. If elevated, insulin tells the body to store more fat. Also, elevated levels of insulin prevents the body from burning fat. Now add in extra cortisol because you’re stressed on a daily basis. This is like adding kerosene to a fire. It is only going to magnify the “fat storing” message to the body, and you store more fat, especially weight around the middle. Women usually gain weight in the hips and thighs and not in the midsection. The weight gain in the middle is cortisol or stress driven weight gain. The strategy to lose belly fat needs to focus on reducing the insulin burden and balancing cortisol. As a woman enters her 40’s and the female hormones are declining, it makes the body more sensitive or responsive to both insulin and cortisol, which is why the weight gain seems to come out of nowhere. Reducing stress is, of course, easier said than done. We all have stress in our lives, but this is by far the most important tip on the list because “stress” is causing all the problems. When we say “stress,” we mean cortisol, which is referred to as the “stress hormone.” Cortisol is an important metabolic hormone. We can not live without it. It helps us “survive” on a daily basis. Some acute or short periods of stress is beneficial to the body. It can increase energy, mood, concentration and boost immune function. However, as stress becomes chronic, the body can keep up and begins to regress, and weight gain is often a result. Do your best to try and reduce your stress. Whether that is seeing a therapist, removing toxic people, career change or buying a boat and sailing off into the sunset. I understand it can be challenging to eliminate stress. If you cannot remove stress, try to get better sleep. Read below and check out our post on Tips for Sleep. Insomnia and sleep issues, in general, is one of the most common problems for perimenopausal women. With work, kids, and finances you already have lots on your plate. Not being able to sleep only makes it worse. Stress and sleep go hand in hand. Unfortunately, the more stress we have, the worse we sleep. This is because your cortisol is elevated at night. Elevated levels of cortisol at night will result in trouble falling and staying asleep. If sleep is disrupted, then we can’t get the rest and recuperation we need on a nightly basis to keep going. Over time, not sleeping adds to your stress level and causes continual weight gain. Looking for tips to improve your sleep? Read our article: 11 Tips for Improved Sleep. Liquid calories of any sort can have a significant glycemic impact, meaning it can raise your blood sugar and insulin excessively. This includes soda, coffee drinks, energy drinks, smoothies, fruit juices, beer, wine, and liquor. This also includes beverages with kind of artificial sweeteners. Even though artificial sweeteners are marketed to have no caloric value, they still cause your insulin to rise, which is precisely what needs to be minimized. For years, we all have been told to eat less and exercise more as an approach to weight loss. Eating less food translates into consuming fewer calories and exercising more translates into expending more energy. This “energy in / energy out” theory flat out, does not work. It only complicates the system and will not equate to long-term weight loss success. Sure you might lose 6-8 lbs in the beginning by restricting your calories and exercising like crazy. Ultimately you will only gain back plus six more pounds back in your gut. The body is too complicated for the calories in / calories out approach to work. This theory does not take hormones into consideration at all. Weight loss is a hormone problem, not a calorie problem. In fact, the body is very sensitive to a drop in calories. The longer someone is on a “diet,” the more the body tries to compensate, invariably resulting in rebound weight gain. How many times have you seen someone lose 20 lbs, but eventually gaining back 30 pounds? Weight loss due to a caloric restriction based diet is not sustainable and will encourage the body to store more fat. We have been told by experts to eat small frequent meals throughout the day for decades. This old approach told us that eating small frequent meals would help weight loss and maintain an ideal weight. Research has shown that the average American consumes at least 3.3 times per day and some eating up to 10+ times per day. Every time you eat, your blood sugar goes up. As a result, insulin is secreted to deal with the blood sugar. Eating small frequent meals causes your blood sugar and insulin to bounce up and down all day long. This constant rise and fall to blood sugar and insulin often become too much for the body to handle. As mentioned above, insulin is the only fat storing hormone. If your insulin is rising all day long, the more weight you are going to store, particularly in your belly. A fitness trend that has become popular over the last few years is high-intensity interval training (HIIT). This has been coined as one of the best ways to burn fat and lose weight. Certainly, there are benefits to exercise, but you have to remember that exercise of any kind is a “stress” to the body. That means exercise will raise cortisol levels. The more intense and the more frequent the exercise, the more cortisol your body needs to engage in the activity. A quick note about cortisol: Cortisol is categorized as a “glucocorticoid” hormone, which means it is a steroid hormone that influences blood glucose. Cortisol helps us to get from meal to meal. If we eat something in the morning for breakfast, blood sugar goes up, and inulin rises in response to the glucose. Over the next few hours, blood sugar and insulin reduce and glucagon and cortisol goes up and tells the body to make more glucose. Cortisol signals the liver to produce glucose by a process called gluconeogenesis. The liver releases more glucose into the blood, so the pancreas secretes insulin to compensate. The more “intense” and frequent the exercise, the more cortisol is released, hence the more blood sugar the liver will release, which results in more insulin. The presence of insulin signals the body to keep storing fat, especially around the middle. 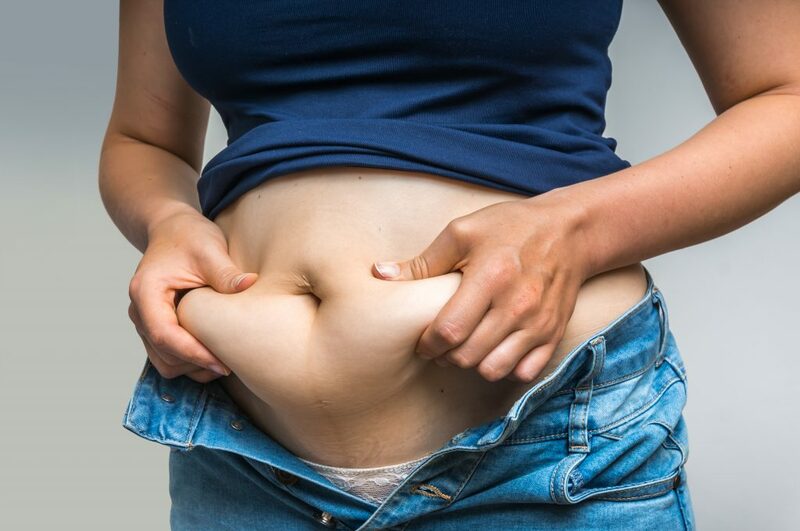 For women, belly fat is an indication of cortisol-induced or stress weight gain. Many women tell us they are exercising 4 to 6 times per week. They are doing some boot camp, spin class or high-intensity cardio class of some sort. We can’t stress enough that you cannot “exercise” the weight off. Burning calories is not the key to losing weight. Balancing hormones is the answer to losing belly fat. By replacing your intense cardio with weight lifting and walking will have a dramatic effect on your insulin and cortisol levels. Meaning, a dramatic impact on weight loss especially, belly fat. I have many patients that look at me cross eyes when I tell them to stop the cardio. They are terrified to skip spin class for resistance bands, weights and walking. But three months later they will walk into my office 15 lbs lighter and stronger. The goal of exercise is not to burn calories. The goal is to balance and optimize insulin and cortisol. Resistance training helps the body increase insulin sensitivity. This increased insulin sensitivity makes the pancreas more efficient at managing blood sugar. Meaning your pancreas will produce less insulin over time. Remember insulin is the only fat storing hormone. With a lower insulin burden, this allows the body to mobilize body fat and burn it for energy (that mean less belly fat). When engaging in some form of resistance based exercise, your muscles are forced to adapt. Over time, as your muscles continue to adapt to increasing resistance, they become more metabolically active. This increases your metabolic rate (aka: your metabolism is faster!). As your metabolic rate increases, your body will inevitably burn more body fat in the 23 ½ hours you are not working out (popular term: “afterburn”). 8. Reduce Sugar and Refined Carbs: This might seem obvious, but it is worth mentioning. The average American consumes between 200 to 300 grams of carbohydrates on a daily basis. Not to beat a dead horse, but this puts enormous pressure on the pancreas to produce enough insulin. Remember carbohydrates convert to glucose/sugar in the blood. That signals insulin production from the pancreas. The more refined or processed the carbohydrate, the more glucose rises. Hence, the more insulin is skyrocketing in your bloodstream. A piece of cake is going to have more of an elevated level of glucose and oversecretion of insulin than an apple. Over time, due to the chronic oversecretion of insulin, your liver, muscles and brain stop responding to the insulin and blood glucose will start to rise. The body tries to fix the problem and lower blood sugar by secreting more insulin, which only makes the situation worse. This process is called insulin resistance (prediabetes) and affects about ⅓ of the US population. This translates to about 100 million people that are insulin resistant in the US. Carbohydrates, in general, are not bad and should not be avoided. However, it is all about consuming the right kind of carbs at the right time. In fact, carbs can be very helpful when engaging in resistance training based exercise and can be used as part of the recovery process. Consume plenty of vegetables and dark leafy greens every day. This provides you with some carbs, but also plenty of soluble and insoluble fiber to maintain regularity. Plus, the fiber from veggies and greens helps to keep the balance of the microbiome, which is the bacteria found in the large intestine. Also, make sure to add in some starchy carbohydrates into your weekly diet. This includes food such as yams, sweet potatoes, beans, rice, and quinoa. Cycling carb intake on a regular basis can be beneficial in the fat burning process. Try to consume fewer carbs on non-workout days and increase your carbs on workout days. On non-workout days, your carb intake could be 25 to 75 grams depending on your progress and fitness level. On workout days, your carb intake could be 75 to 150 grams, again depending on your progress and fitness level. Note: a daily carb intake below 50 gram is considered to be very low and may put you into ketosis. Since the 1950’s we have been told to avoid fat. It is has been a food villain for decades. Back in the 90’s the craze was anything “low fat.” Some of these beliefs still exist today, but we want to encourage you to consume more healthy fats on a consistent basis. One of our rules is you need fat to lose fat. Of course, you still want to stay away from trans fats, hydrogenated oils, and vegetable oils. Healthy fats are in foods like nuts, seeds, high-quality animal protein, wild caught fish, butter, egg yolks, and avocados. Plus, when you lower your carbohydrate consumption, your caloric intake will decrease as well. Increasing your fat intake will help to offset the calories lost from reducing your carbs. One of the big mistakes many people make on a low carb diet is their calories drop too low. Increasing your healthy fats is a great way to compensate. The other good thing about fat is that it does not raise blood sugar or insulin. When we eat fat by itself, there is virtually zero impact on blood sugar and insulin. This is a great way to get some calories, but minimize the blood sugar and insulin spike. However, something to keep in mind, fat by itself, or fat with a protein source has minimal impact on blood sugar and insulin, but fat consumed with carbs has a significant effect on blood sugar and insulin. If you are going to consume fats, it is best not have too many carbs at the same time. A good strategy is to have a fat and protein source for breakfast and lunch and consume protein and carbs for dinner. This helps to keep your fats and carbs separated on a consistent basis. We do encourage people to eat a low carb – high-fat diet (LCHF). The low carb aspect is relative to the person and situation. The high fat is also relative to the person and situation. A LCHF diet is not automatically a ketogenic diet, which is accomplished by lowering your carbs below 30 grams daily. With either a LCHF or ketogenic diet, there is a misconception these are both intended to be high protein diets. We do not necessarily encourage a high protein diet; however, we do want people to eat enough protein on a consistent basis. Consuming a variety of 2 to 8 oz servings of protein two to three times per day would not be considered a high protein diet. The body needs essential fatty acids and essential amino acids provided by protein to function properly. Plus, protein also contains b-vitamins, iron and other minerals that are necessary to the fat loss process. The liver is an amazing organ. It is involved in over 600 different metabolic processes, and it plays a significant role in energy metabolism. So, if you want to burn fat more efficiently, then you need to be gentle on your liver. What you do and eat every day is what matters the most. Things that burden the liver are caffeine, alcohol, sugar, medications, and stress. The more of these compounds you consume, the more sluggish the liver will work over time. This can lead to fatigue, digestive issues, and weight gain. Moderation or infrequent consumption of those things can be very helpful in making sure your liver is working to its full capacity. We know women in their 40’s and 50’s struggle with their weight. We wrote the Keto Carb-Cycling Program (KCCP) specifically to help these women that the success they desire. The KCCP will help to balance glucose and reduce cortisol and insulin burdens. It will also help your liver function more efficiently. By reducing the burden of cortisol, especially at night, will help with sleep. Losing weight, specifically belly fat is not impossible, but you do have to have the right strategy to get the results you want. Click the link to download our program. If you have any questions, please leave a comment below, or send an email to help@progressyourhealth.com.